Dan Webb’s carved wood sculpture Destroyer tells a story of becoming. Two finely modeled arms emerge from a rectangular, human- scale block of fir. 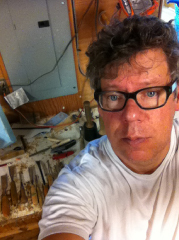 The gloved hands grip a carver’s mallet and a chisel. 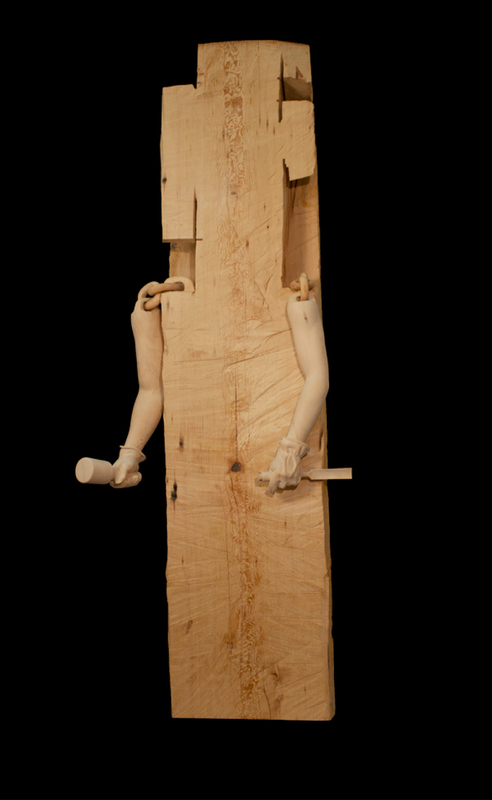 At the shoulder, these disembodied limbs are bound to the main body of the sculpture with two links of wooden chain, while the uncarved trunk still shows the rough cuts that liberated the arms from the overall form. The arms attempt to carve themselves out of their wooden prison, bringing to mind Michelangelo’s claim that he saw the angel in the marble and carved until he set him free. Webb’s work often teeters on the brink between the representational and the abstract. Its geometric massiveness calls forth the tradition of Minimalist sculpture, even as the passages of fine carving reference a history of realistic woodwork that reaches back centuries. It’s hard to see the rings of the tree and not think about time. It’s hard to make a carving and not think about issues related to aging and mortality. I’m led to these things. It seems mawkish and maudlin to talk about them, but the medium suggests it.